A Shepherd's Heart: Keeping & Evaluating Hope! HOPE...its another vital part of our existence. Not just general hope (that too of course) but the extraordinary and true hope that comes from salvation in and relationship with Jesus Christ. As you survey your conduct and the conduct of others, let me encourage you to evaluate whether or not you are helping or hindering hope. 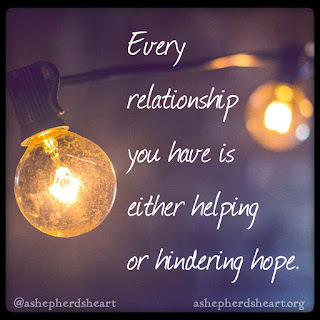 #1 Are the relationships in my life helping or hindering hope? #2 Who are the people who are helping or hindering hope in my life? #3 Am I helping or hindering hope in the lives of others? Then ask for The Holy Spirit for help in adjusting where needed! Hold on to hope my friend...Don't let this world...anyone or anything get you down! hope is a gift from God and He wants you to be hopeful as you seek to do His will and seek Him with everything that is within you as you journey through this life He's blessed you with! Please share this post with someone today!